Come face to face with more than 1,000 Estuarine Crocodile (Crocodylus Porosus) and Malayan Gharial (Tomistoma Schlegelii) in a 22 acres land-scaped setting with natural breeding enclosure and man-made sanctuary ponds specially carved out for the creatures. A stroll around its perimeter allows you to safely view an amazing collection of crocodiles up close. The crocodile farm opens everyday of the year, is also home to other exotic animals from tropical countries. Taking an adventurous stroll through the farm, you come face to face with some exotic animals such as Southern Cassowary, Python, Binturong, Sun Bears, Gibbon, Porcupines, a band of cheerful Monkeys, baby crocodiles and the likes. The different species of exotic and domestic animals are kept in spacious cages separated from the visitors. Visitors are allowed to feed the animals with bananas available from the canteen. Take a leisure and educational tour around the mini zoo and learn about the animals and their habitat. It will provide an enlightening and awe-inspiring experience for school students, interest-organisations, associations and individuals of all ages. 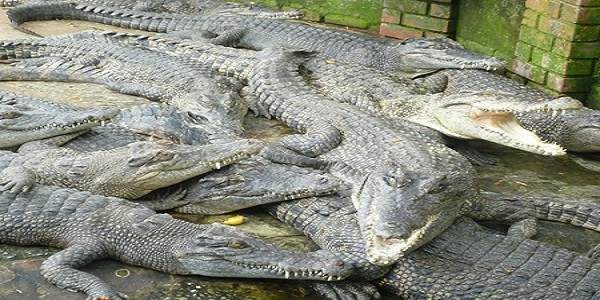 The Miri Crocodile Farm is the first and the largest Crocodile Farm in the northern region of Sarawak. This attraction is registered with and recognised by Convention on International Trade in Endangered Species of Wild Fauna and Flora (CITES, Registration No. A-MY-509). Lot 164, 24Km Miri-Kuala Baram Road, 98000 Miri, Sarawak, Malaysia. Located near Kuala Baram River Mouth (previous Ferry Terminal), a pleasant scenic Coastal drive along Miri-Kuala Baram Road from Miri will take you there in 20 minutes.